Garden City has multiple reasons for a massive defensive improvement in 2015. There are plenty of returning starters and experience, and the Buffs have been much better at limiting opponents’ big plays. Senior linebacker Nalen Rincones, has been one of Kansas’ top defensive playmakers for three years, and a pair of outstanding sophomores have emerged in lineman Demarcus Elliott and safety Quinton LaPointe. In addition, several starters have stepped up their play, including junior linebacker/kicker Zeke Herrera. The Buffaloes have permitted 12.7 points per game en route to a 6-0 start, already a better mark than last year’s 4-5 team. Garden City is also better on special teams this season. Coach Brian Hill calls this defense “by far” the best unit in his six years as head coach, including an 8-4 team in 2013 that reached the 6A semifinals. The Buffs are 6-0 for the first time in 24 years. In Hill’s first five seasons, Garden City’s defense had permitted no better than 14.3 points per game entering districts, including 20.2 and 27 a contest the last two years. It’s the Buffaloes’ impressive defense and power running attack that adds more intrigue to Class 6A, District 8, arguably Kansas’ best district. The district features Wichita Northwest (6-0), Hutchinson (5-1) and Dodge City (4-2). Northwest ranks No. 3 overall in 6A and its 567 yards per game are on pace to break the 11-man state record. Hutchinson is the defending state runner-up, and Dodge City, the Buffs’ biggest rival, stands at 4-2 with 50 points and 500 yards a contest in its pass-heavy spread offense. Garden City, though, features the No. 6 defense in 6A – among the best on the western half of the state. Hutchinson, at No. 9, is the only other District 8 opponent with a defensive unit in the top-12 of the 32-team classification. In 2013, Garden City entered districts at 4-2 and wasn’t considered the favorite. The Buffs lost, 40-24, at Maize in Week 7, then defeated Hutchinson (35-24) and Dodge City (41-20) in home games to claim the runner-up spot. Garden City won at Northwest, 40-36, and then defeated Wichita Heights, 35-28, at home to reach the semifinals, its best team since 2005. The two playoff wins came in the final minute. Like 2013, Garden City gets home field advantage twice in districts. The Buffs are home with Hutchinson on Friday before traveling to Northwest next week, then closing out the season at home against Dodge City in the rivalry “Hatchet Game” that will also decide the WAC title. Garden City’s offense has averaged 37.7 points per contest, its best entering districts under Hill. The 2013 squad, led by standout quarterback Greyson Tempel, was second at 36.3. Senior Jared Koster broke the Buffs’ career rushing record last week with 2,648 yards and Hill presented him with the game ball, the first time he’s done that in his career. Koster has rushed for 811 yards, and junior quarterback Jesse Nunez has 694 rushing and 489 passing yards. Garden City has run the ball 81 percent of the time with 319 rushing yards a contest. In 2013, the Buffs ran 57 percent for 192 yards per game. Last year, the numbers were 68 percent and 206 yards. Hill called Nunez, the starter as a sophomore, “very raw” earlier in his career. Nunez and Herrera were each state runner-ups in wrestling in the winter. Junior Peyton Hill, the coach’s son, starts at fullback. “Really done a good job of orchestrating (the offense) and making big plays on the money, and that comes from his experience from a year ago,” Hill said of the signal caller. The return game has been virtually non-existent the last two years, but already has 530 return yards. GC had 605 all last season. “Our special teams, I thought really dominated most of every game that we have played this year,” Hill said. The defense has allowed just 187.3 yards per contest after it finished last in the WAC at 382.6 yards per game in 2014. Three of the touchdowns Garden City has allowed hasn’t come against the defense. One came from special teams, two from the Buffs’ offensive turnovers. Rincones, the team leader in tackles the last two seasons, ranks second with 44 stops; Herrera leads with one more. The 6-foot-4, 280-pound Elliott didn’t record a varsity tackle in 2014 and went through some injuries. This year, he has 32 stops and leads the WAC with 14 TFLs. The rest of the defensive line features seniors Derek Cook and Jose Coreas (conference-best five sacks) and junior Benny Hernandez. The back four features seniors Thomas Marquez and Dakota Brungardt, LaPointe, and senior Patrick Clifford, one of the captains. The special teams, led by Herrera and Hill, have helped with field position. Herrera has nine touchbacks, and Hill has averaged 38.2 yards per punt with four of 18 inside the opponents’ 20-yard line. “Field position has played a big role in our success here early,” coach Hill said. Shawnee Mission East (5-1) – The defending 6A champion Lancers had their 17-game winning streak stopped by Lawrence Free State, 32-20, in Week 5. Still, East is capable of repeating as 6A champs. Luke Kaiser has been effective in replacing Gunnar Englund at quarterback. Mike Bamford, Wyatt Edmisten, Kaiser, and Jack Tyler all carry the load with the run game. When Kaiser looks to throw, Sky Tate has hauled in more than 400 receiving yards and eight touchdowns. KC Harmon (2-4) – Harmon snapped a 31-game losing streak with a 30-26 win over Topeka Highland Park back in Week 2. Prior to that, Harmon’s last win came on October 7, 2011 against KC Wyandotte. The Hawks also beat KC Washington, 32-16, in Week 5. Shawnee Mission North (1-5) – North opened the season with a 22-8 win over Shawnee Mission South, but has dropped five straight games since. Quarterback Will Schneider (6-3, 200) is a nice player. The junior has passed for 1,277 yards and seven touchdowns and added 218 yards and three scores on the ground. Sophomore Reese Sila leads the Indians with 235 rushing yards and two scores. KC Wyandotte (0-6) – Wyandotte is winless on the season, but the Bulldogs have lost three games by less than 12 points. The Bulldogs beat Harmon in district play last season for one of their two wins. Wyandotte has not reached the playoffs since 2006. Key Games: (Wk 9) SM North is the road team against SM East, although the game will be played at SM North Stadium. Either way, it should decide both playoff spots. Blue Valley North (5-1) – The job Andy Sims has done at Blue Valley North is one of the better stories in the first half of the season. The Mustangs are 5-1 and share the lead in the Eastern Kansas League. Their loss came to Aquinas in Week 2, but since then North has delivered a dramatic 28-27 comeback win over Blue Valley. Quarterback Joey Dolan has passed for 1,563 yards and 18 touchdowns this season, while Cooper Lantefield has rushed for 498 yards and five scores. Charlie Brock, Josh Pederson, and Alex Blake make up a dynamic receiving group for Dolan to throw to. Shawnee Mission West (5-1) – The fifth-ranked Vikings’ only loss came 42-21 to SM East. West has posted impressive wins at Lawrence Free State (34-26), over Olathe Northwest (20-12), and at Olathe East (42-14). Nigil Houston leads the rushing attack with nearly 450 yards and five scores. Kirby Grigsby and quarterback Adam Rellihan have each added five rushing touchdowns. Rellihan has passed for 683 yards and five scores. Shawnee Mission Northwest (1-5) – Bo Black’s transition to the Sunflower League has been a tough one. The former Great Bend and Hays coach got his first win at Northwest, 44-29 over SM North back in Week 2, but hasn’t captured a second yet. The Cougars have gone just 8-26 since the 2011 season. Shawnee Mission South (0-6) – The Raiders are winless in Brett Oberzan’s first year as coach. South has struggled to score points, only averaging 6.7 points per game. Blue Valley (4-2) – Blue Valley has a resume win over 4A-I No. 1 Bishop Miege. The Tigers topped the Stags 42-35 back in Week 3. The Tigers have dropped two straight games though. Blue Valley North rallied to upset the Tigers 28-27 in Week 5, then last week St. Thomas Aquinas used a big second half to pull away 35-13. Still Blue Valley has plenty of talent to make a run in 6A. Colton McCumber is a dual threat at quarterback, while A.J. Totta and Williams Evans round out one of the state’s top backfields. Gardner-Edgerton (1-5) – The Trailblazers stopped a 12-game losing streak with a Week 3 win over Blue Valley Southwest. Since then, Gardner-Edgerton has dropped three straight to Blue Valley West, Aquinas, and Blue Valley North. The Blazers had reached the playoffs seven consecutive seasons before going winless in 2014. Olathe South (1-5) – After a hard fought 14-6 win over Olathe East in Week 2, the Falcons have dropped four in a row in the Sunflower League. Olathe South has struggled to score points all season. The Falcons average just nine points per game on the season while giving up 39 per game. Blue Valley Northwest (0-6) – It has been a tough season for the Huskies who are staring at their first losing season since 2010. Northwest has been competitive the past three weeks in losses to Blue Valley North (28-21), Blue Valley Southwest (34-28), and Blue Valley West (38-35). Lawrence (7-0, 1-0) – Top-ranked Lawrence is loaded with talent and has played well all season. The Chesty Lions started off district play with a 35-7 win over Olathe Northwest on Thursday night. J.D. Woods set the Lawrence career rushing record with 3,289 yards, passing Michael Cosey. Woods went for 286 yards and four scores in Thursday’s win over the Ravens. Olathe North (6-0) – Olathe North is unbeaten in Chris McCartney’s first year, but with sort of a catch. The Eagles were bested on the field 35-33 by Rogers-Heritage (Ark.) in Week 1, but found out later that Heritage would forfeit for using an ineligible player. North has posted a strong win over Free State, 24-20 in Week 2. Olathe Northwest (5-2, 0-1) – The Ravens are one half away from being 6-1. Olathe Northwest led SM West 12-0 back in Week 2, but the game was delayed due to weather until the next day. West eventually won 20-12. The Ravens haven’t reached the playoffs since 2011, and they’ll have an uphill climb after falling to Lawrence on Thursday night. Olathe East (3-3) – Jesse Owen’s first year at Olathe East has resulted in a 3-3 mark after six weeks. The Hawks won three straight games over SM South, SM North, and SM Northwest before falling to SM West last week. Topeka High (6-0) – Topeka High has breezed through the first six weeks with a 31-20 win over Emporia as their only test. The Trojans average nearly 51 points per game, but the competition will get much tougher this week. Mike McCoy has rushed for 960 yards and 19 touchdowns. Quarterback Corey Thomas has added 574 yards on the ground, while passing for 732 yards and 15 scores. The Trojan’s big offensive line will need to allow the offense to control the ball in district play. Washburn Rural (5-1) – Rural started the season with four wins before a 36-13 loss to Junction City. Matthew Williams leads the Junior Blues in rushing with more than 600 yards and nine touchdowns. Quarterback Mitchell Schurig has kept the offense in balance by throwing for 570 yards and three scores. Manhattan (4-2) – Manhattan’s two losses are 21-14 to Topeka Hayden, and 17-14 in overtime to Junction City last week. Junior quarterback Ian Trapp has rushed for 751 yards on 83 attempts. The transfer from Ellsworth has also passed for more than 500 yards on the year. Trapp was stopped on fourth-and-goal at the 1-yard line in Manhattan’s overtime possession allowing Junction City’s game winning field goal. Lawrence Free State (3-3) – Free State began the season with three straight losses to Shawnee Mission West (5-1), Olathe North (6-0), and Lawrence (6-0). The Firebirds then won three in a row including a 32-20 upset of then No. 1 Shawnee Mission East. Bryce Torneden is a dynamic quarterback, while Sam Skwarlo has been solid out of the backfield. Free State appears ready to make another strong run in the playoffs. Key Games: All games will be key in what is one of the state’s best districts. Junction City (6-0) – Junction City remained unbeaten with a 17-14 overtime win over rival Manhattan last week. The Blue Jays trailed 14-7 until the third quarter when Timothy Bell returned a Manhattan fumble for a touchdown. Raye Wilson is JC’s leading rusher with 918 yards on the season and is averaging nine yards per carry. Ryan Henington has passed for 467 yards. The defense is Junction City’s strength as the Blue Jays only surrender nine points per game. Wichita North (1-6, 1-0) – Wichita North has only won one game in each of the past four years, but reached the 6A playoffs at 1-8 in two of those years. The Redskins are hoping to get back to the postseason after Thursday’s win over Wichita East. Wichita Southeast (0-6) – Southeast is giving up an average of 52 points per game. The Golden Buffaloes haven’t reached the postseason since 2007. Wichita East (0-7, 0-1) – The Blue Aces have been competitive in losses to Kapaun Mt. Carmel (35-20) and Wichita South (32-16). East’s playoff hopes took a hit Thursday night with a 22-5 loss to Wichita North. Key Games: Wichita North has the inside track on the runner-up spot after defeating East on Thursday night. (Wk 8) Wichita North travels to Wichita Southeast. Derby (5-1) – The Panthers, currently ranked No. 3 in Class 6A, have only a Week 3 last-second road loss to Mill Valley where it outgained the Jaguars. Quarterback Brady Rust has 98 carries for 847 yards and thrown for 773 yards. Wichita South (4-2) – South, one of Kansas’ surprises, lost the City League championship in a suspended game versus Wichita Northwest on Saturday. The Titans have one winning season in its last 18 years. South features dual threat quarterback Allen Bishop, one of the City League’s top playmakers, and a strong defense. Bishop leads the City League with 723 rushing yards and passed for 617 yards. Wichita West (3-3) – West has put up big offensive numbers with veteran coach Weston Schartz with 37.3 points per contest but has permitted 36 a contest. West has lost three in a row. Danthony Andrews ranks second in the City League with 700 rushing yards. Haysville Campus (2-4) – Campus opened with a 20-19 victory against Campus before a 1-4 run. Campus won 35-14 at Maize in Week 4. Quarterback Colby Leeper has completed 122 of 214 passes for 1,261 yards. Key Games: Derby is the favorite, and (Wk 7) West at South will match West’s high-flying offense versus South’s defense for the runner-up spot. Garden City (6-0) – The Buffs have one of the best scoring defenses in the geographic western part of 6A and have delivered much improved special teams. Garden City is 6-0 for the first time in 24 years and has the top defense in the six-year Brian Hill era. Senior running back Jared Koster broke the school record for career rushing yards last week against Wichita East. Senior linebacker Nalen Rincones is one of the top defensive players in Kansas. Wichita Northwest (6-0) – Northwest is currently on pace to break the Kansas 11-man record for total yards per game and has averaged 567 yards per contest. The Grizzlies, 6A’s top scoring offense, has yet to throw an interception. Northwest won its first City League title since 2004 with a victory versus Wichita South last Saturday in a suspended game from Thursday. Senior quarterback Kevin Folsom is expected to return after he missed Saturday’s action. Jahlyl Rounds and Antonio Joyner have rushed for 656 and 626 yards respectively while combining for 16 touchdowns. 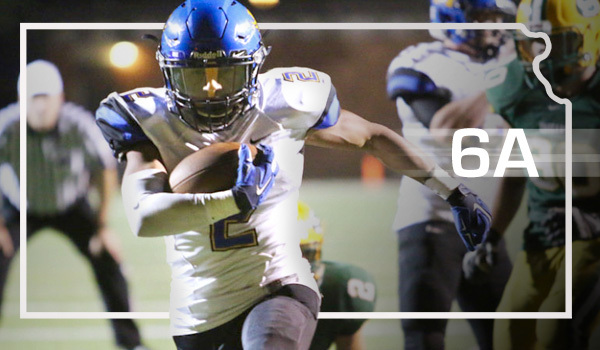 Folsom adds 574 rushing yards and eight scores, while passing for 1,019 yards and 14 scores. Hutchinson (5-1) – The Salthawks have averaged just shy of 500 yards per game in the last two weeks but have had trouble putting teams away because of turnovers and penalties. Hutchinson has relied heavily on the ground game and has become more efficient passing the last couple of weeks. Three backs have between 301 and 467 rushing yards. Dodge City (4-2) – Dodge City opened 1-2 before three straight victories. The Red Demons have averaged 50 points and 501 yards per game in its wide-open, spread offense. Quarterback Caden Walters has completed 64 percent of his passes and thrown for 1,585 yards with 17 scores versus four interceptions. Dodge City made the postseason each year from ’09-’12 but hasn’t made the playoffs since. Key Games: All games are key in what is arguably Kansas’ best district.